The year is definitely coming to an end quickly isn’t it? It seems like every weekend there is an activity or an event or a holiday get-together. And next thing you know it’ll be New Year’s Eve. I love this time of year, I love being with my family and driving around looking at lights (with the air conditioner on pretending it’s cold) and listening to Christmas music. I love Christmas shopping (online) and I don’t mind wrapping presents. I really enjoy all of it. But I will admit I don’t always like all the “busy-ness “that comes along with the holidays. It definitely takes an effort to stop for a second and sloooow down. You know, enjoy the moment? So, to avoid the feeling of frenzy and stress I’m trying to keep up with the madness as orderly as possible. I have rekindled my relationship with my pretty Franklin Covey planner, and am trying to stay organized. I’m keeping up with my to do lists and trying not to lose them. So far so good. I’m also trying to plan simple meals, keep my eating clean and really get in some exercise every day…when all of this stuff falls together things just seem to flow better for me…can you relate? So what I’m giving you today is a super simple, super tasty and can pass as kinda fancy recipe. You can serve this to guests at a get together or dinner over an antipasto salad, on a bruschetta bar or just as a side dish. Or you can do what I’m going to do and top it on my salad for dinner tonight. How do you like to use vinegar? 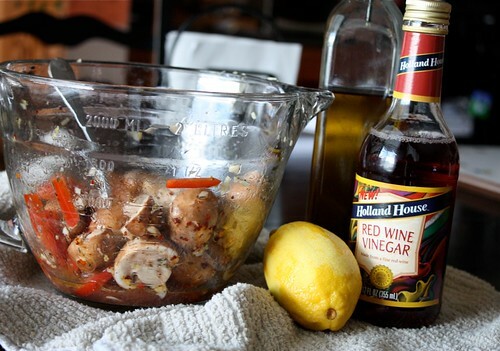 Do you have a favorite tip to share in how you include Holland House Vinegar or Cooking Wines in your holiday cooking? If you need ideas visit Holland House’s website or Facebook page where you can find recipes, shop for vinegars and cooking wines or sign up for their SPLASH Recipe Club. Good stuff! Combine all ingredients in mixing bowl. Gently toss to combine. Cover and refrigerate for at least 8 hours, stirring periodically to help blend flavors. Best if marinated overnight. Can be served chilled or at room temperature. PS…Thanks to everyone who entered the figgy giveaway! Loved reading all your comments and I am definitely craving homemade fig newtons now! Congrats to Shelby over at Grumpy’s Honeybunch for winning the giveaway! Thank you to the California Fig Advisory Board for providing the prize! I love this time of year, too and, as you said, it is so much more enjoyable if I manage to stay organized and work in some regular exercise. These mushrooms are so pretty. They would be perfect over a salad or served with toothpicks as a cocktail party offering. 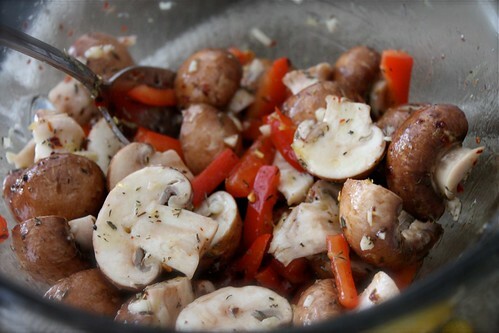 I love mushrooms and anything marinated. I will be making these soon! Good for you for being so organized during this busy time of year. I am starting to feel the pressure and need to get in shape w/my plans:)These baby bellas look gorgeous! Love the marinade. Love this! Going to make it tomorrow night as a side (or topping) to our veggie burgers. Thanks again for another great idea. Oh my, these sound fantastic! 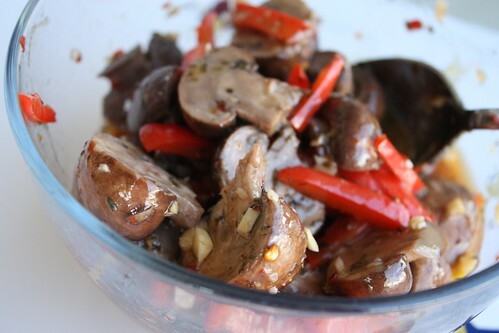 Marinated mushrooms might be one of my favorite things! 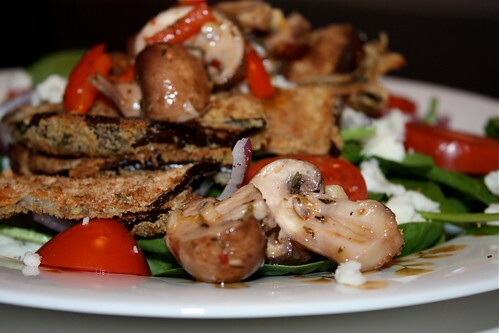 I’m glad you liked my post =) I can always count on you for a great dinner idea! everything looks fabulous nice dinner! I can never get enough mushrooms and these look scrumptious. I love the combo’s that you always come up with when you play around in the kitchen. 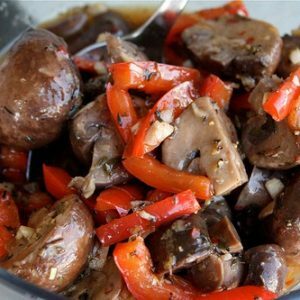 I am definitely going to make these….my dad loves marinated mushrooms – will be a great treat for him! Those mushrooms look amazing! I’ve never marinated them myself but think I may have to try… what a healthy snack idea! These look incredible, Aggie! 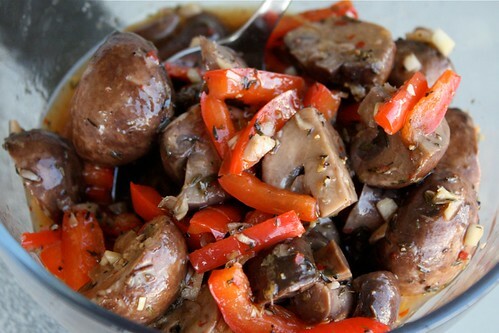 I love marinated mushrooms. Thanks for sharing!